Editor’s Note: This is a guest post from Brian Muse, our lead developer on You Rather. He’ll be guiding you through a three part journey of PHP applications over the next few days. This tutorial is intended for readers who know the very basics of PHP and Object Oriented Programming (OOP) and would like to create a basic web application. To make this a little bit clearer, I’ve split this tutorial up into three separate posts. Each post will cover a major step in setting up a basic PHP web application. It’s always a good idea to know where you’re going. Before you start creating and coding files it’s best to set your goals, map out the project and make decisions about your folder structure and what files you’ll need to make to accomplish your goal. The goal for this project is fairly simple: Create a basic PHP web application with user registration, the ability to log in and out and a way for users to update their settings. An OOP PHP project utilizes classes and objects to perform many of the operations that the application requires. When planning, you should think about what classes you will need. For this project we’ll be making three classes. The first is the User class, which will hold information about a particular user and a basic save() function. Another class, UserTools will contain functions that have to do with users, such as login(), logout(), etc. The final class is the first class we’ll be coding: the database class. This class will handle connecting to the database, updating, inserting new rows, retrieving rows, and more. Aside from classes, we’ll utilize a file called global.inc.php. This file will be called on every page and will perform general operations that we commonly require. For example, it is this file that will handle connecting to the database on each page. The rest of the files are the pages the user will navigate around. These include index.php, register.php, login.php, logout.php, settings.php and welcome.php. The “id” field is used as the primary key and will be the main unique identifier that we’ll use to differentiate between users in the database. The “username” is also defined as a unique key. Other fields include “password” (which will be stored after it is hashed), “email”, and “join_date” (an sql datetime variable). The first class we’ll be making for this project is one to handle database operations. The goal is simple: to take the work out of using our database so that we deal with as little SQL as possible and to have data organized and returned in a easily readable format. //on every page that needs to use the database. //true, then it will return a single row instead of an array of rows. //Select rows from the database. //returns a full row or rows from $table using $where as the where clause. //return value is an associative array with column names as keys. //Updates a current row in the database. //and the values are the data that will be inserted into those columns. //$table is the name of the table and $where is the sql where clause. //Inserts a new row into the database. //$table is the name of the table. //return the ID of the user in the database. After the class definition you’ll see four variable declarations: $db_name, $db_user, $db_pass, and $db_host. These should be set accordingly, based on how you’ve set up your database. You’ll most likely leave $db_host as localhost. These variables are defined as “protected” and as such they will not be accessible from outside the class. From anywhere inside the class, however, they can be retrieved by using $this->db_name, $this->db_user, etc. The first function is called connect(). This function uses those protected values to open up a database connection. This connection will remain open for usage anywhere on the current page (not just from within the class). The second function is called processRowSet(). The purpose of this function is to take a mysql result object and convert it to an associative array, where the keys are the column names. The function loops through each row in the mysql result and the PHP function mysql_fetch_assoc() converts each row to an associative array. The row is then pushed onto an array which is ultimately returned by the function. This formatting makes the data far more readable and easier to use. There is a second argument called $singleRow which has false as a default value. If set to true, only a single row will be returned instead of an array of rows. This is useful if you’re only expecting a single result to be returned (for example when selecting a user from the database by using their unique id). The final three functions perform basic MySQL functions: select, insert, update. The goal of these functions is to minimalize the amount of SQL that needs to be written elsewhere in the application. Each basically builds an SQL query based upon the value passed in and executes that query. In the case of select(), the results are formatted and returned. In the case of update(), true is returned if it succeeded. In the case of insert(), the id of the newly inserted row is returned. As you can see, the tables column names for the columns being updated are the keys and the values are the data that is being set in those columns. Try expanding the DB class to include a function for deleting a row from the database. Expand the select() function to take an array of column names to select with a default of * to select all columns. This wraps up part 1 of the series. 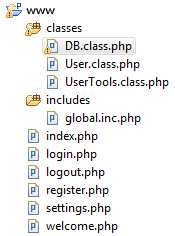 We’ve managed to organize our folder/file structure for the project and build our first class, the DB class. In part 2 we’ll build two more classes, User and UserTools. The User class will introduce class constructors. Additionally we’ll start to take a look at global.inc.php and what exactly we’ll be putting in there. This is a very helpful tutorial. I can’t wait for the next part! Awesome! Thanks for sharing. This tutorial gave me a lot of ideas and some different approach to dev PHP app. Thanks again! This is sweet! I just started playing around with PHP and this is perfect, exactly what I was looking for. When can we expect Part 2? I am really digging these style of posts, I am looking forward to the whole series. Congratulations for the great post guys! I’m aways looking for a clear and organized php code, couldn’t been better. The row “$db->connect();” was missing in “Update Sample” or I couldn’t understand that part. And keep the good work! You are absolutely correct. You would need to have opened a connection at some point before you could call update(). I was simply showing the update() usage. Thanks for the confirmation, thought I was kida lost in that part. i havent done some php coding lately and im very much interested on learning and reviewing stuff like these again… already followed you on twitter… nice post! Great article. Why don’t you make him a partner :) Would love to see more PHP related articles and he’s probably very familiar with frameworks (i would love to see some tuts on CodeIgniter). I was ready to learn php, just the need for such articles. wouldn’t it be better to open the connection in the class construct? That would save you a step that could easily be forgotten. Your head is in the right spot, and you could certainly go about it that way. For this set of tutorials, we’ll be creating a file that will act as a bootstrap and open a database connection on every page as well as perform other necessary operations. If you do go about adding it to the constructor, just be aware that if you’re creating multiple instances of the DB object then mysql_connect() will be called multiple times. This shouldn’t cause a problem, though, because no new link will be established and the current link identifier will just be returned. It’s just a bit redundant. I was going to mention making it a singleton, but I wasn’t sure if that was outside of the scope of the article. Making a bootstrap file the code example more clear for me. thank for the explanation. Nice job on the article! Awesome! I’ve just started learning oophp and this tut is very helpful. ;) Thanks and can’t wait for the next one! I appreciate the intent of this article, but this is a good example of why PHP gets a bad rap. The code example here is vulnerable to SQL injection and is very unsafe because user input is passed directly to the query without any validation or escaping. Please check out the following page in the PHP manual to learn about SQL injection, or Google the term to read any of the numerous tutorials on how to safely query a database with PHP. Keep in mind that this tutorial is simply an introduction to making a basic application using OOP with PHP and it’s not intended for use “as-is” in a true, full-fledged web application. As such, I’ve left out sql injection avoidance among other things (no error handling either). I’m just showing the basics here. You are spot on though that as people further expand upon this code and become more familiar with PHP/SQL, protecting against sql injection is a must. Hey nice tutorial! i’ve learned many things but i’m in confused! wheres the constructor function called in this DB class? Yeah, I agree with you on leaving out input validation. That’s something that’s very (very) important but it can seem pointless to someone who doesn’t know a lot about SQL injection. It should definitely be something that you cover in the future. There isn’t a constructor method in this class. Not all classes have to have a constructor method. isn’t this version of the update function better? I’m a beginner myself, so i don’t know. great and very helpful technique. A great tutorial was a great help for me as an expereinced starter in php. I was wondering if you know how to delete a user using this same set of files. I have tried but I’m just a beginner. How can i get something out of the db? Some great functions in here, thx! This tutorial is very detailed. It has given me a few ideas on how to utilize dev PHP app for our windshield repair kit design. This is really a cool tutorial. I loved surfing through it. Great blog and must be very helpful for my nephew who is learning PHP these day. I have bookmarked the link and will share it with my nephew. Write me if you need it! how to make a web apps using php, Thanks ………..
hey friendz try to make IDE for PHP. like .Net so it will create more easy to develop PHP window application. Do you put the SQL code on a simple HTML page? It would have been nice if you would have at least given some hints on how to execute the initial SQL we needed for this tutorial. This article can easily fulfill all flaws of non-experts programmers . please can u provide suggestions as to how to make project in a step by step manner as explained in (part 1,2,3 ) on web traffic analyser (project based on finding out how many people our your website visitors , from where they have come etc…….) using PHP ,HTML only.Its required …………. This is really a Great tutorial for every beginner . I loved surfing through it. How php will read/get this statement “UPDATE $table SET $column = $value WHERE $where” ,it’s one solid string !! This is very informative and helpful. Thanks for sharing. This was exactly what I was looking for, much better than Hello World type examples and combined with http://www.phptherightway.com should really help me out. Thank you! Can we get an admin to ban these guys above? Hi brian… be my friend! Hi Peter, why dont u come over for some muffins later :) Brian would love to be your friend! This is awesome. It’s the base code and everything you need to get started with any web app. Thank you so much!